Semtech Corporation (Nasdaq: SMTC), a leading supplier of analog and mixed-signal semiconductors, today announced a next generation reference design platform for its LoRa™ RF gateway that will enable upgraded features, including GPS-free geolocalization for asset tracking applications, and is compatible with existing LoRa network infrastructure and existing deployed LoRa end-points. The new reference design platform includes additional digital signal processing (DSP) alongside Semtech’s SX1301 baseband processor to enable the new features through a simple software upload. 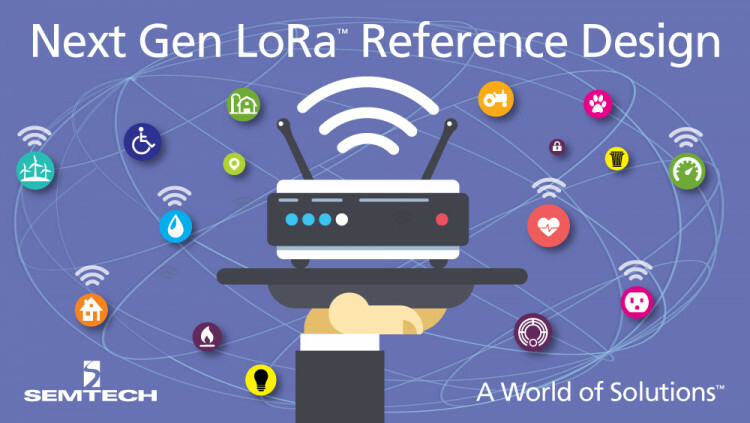 Gateway products based on the new reference platform should be completely compatible and interoperable with existing deployed LoRa-based low power, wide area networks (LPWANs). Since the new geolocalization features will work entirely within the LoRaWAN network infrastructure, an operator will have the ability to add asset tracking to any sensor in the field. Once the new gateway is added, customers can choose to operate the gateway with or without the new features. This substantial addition to LoRa LPWANs is expected to dramatically reduce the cost of deploying asset tracking sensors by removing GPS hardware and increasing the coin-cell battery lifetime. All statements contained herein that are not statements of historical fact, including statements that use the words “will,” “enable,” “allows,” “plans” or “anticipate” or other similar words or expressions, that describe Semtech Corporation’s or its management’s future plans, objectives or goals are “forward-looking statements” and are made pursuant to the Safe-Harbor provisions of the Private Securities Litigation Reform Act of 1995, as amended. Such forward-looking statements involve known and unknown risks, uncertainties and other factors that could cause the actual results of Semtech Corporation to be materially different from the historical results and/or from any future results or outcomes expressed or implied by such forward-looking statements. Such factors are further addressed in Semtech Corporation’s annual and quarterly reports, and in other documents or reports, filed with the Securities and Exchange Commission (www.sec.gov) including, without limitation, information under the captions “Management's Discussion and Analysis of Financial Condition and Results of Operations” and “Risk Factors”. Semtech Corporation assumes no obligation to update any forward-looking statements in order to reflect events or circumstances that may arise after the date of this release, except as required by law. Semtech, the Semtech logo, LoRa and LoRaWAN are registered trademarks or service marks, or trademarks or service marks, of Semtech Corporation and/or its affiliates. Third-party trademarks or service marks are the property of their respective owners.